Produced and developed by a well-known software development company, NetEnt, this pokie takes place in the forsaken attic which is full with ancient items brought from all over the world. Ladies and gentlemen, the Mythic Maiden slot machine game is here promising a lot of pleasure and enjoyment as well as the possibility to score some serious payouts! The company NetEnt was founded back in the 1996, with their first casino launched in 2002. Since then they have become one of the leading providers for various gaming solutions working with some of the most successful online casino operators. Today they can boast with rich statistics, considering over 170 partner casino operators, their extensive game collection with 200 various entertaining games and 21.4 billion gaming transactions in 2014 only. These facts only tell us that the online Mythic Maiden video slot will certainly will fulfill all expectations. The value of a single coin ranges from0.01 up to 0.5. One can choose between 10 different bet levels, which essentially represent the amount of coins per one active line. Those levels affect the amount of player’s wager, which can take values from 30 up to 300. Single coin value affects the amount of the total bet per spin only when one is gambling for real money. The amount of the total bet in this case can be tracked using the information bar just beneath the “spin” button. The value of the maximum payout (jackpot) is x2000. The theoretical RTP percentage is 96.6%. Unfortunately, there are no additional bonus features included. Multipliers are embedded, as well as the possibility of earning some extra costless rolls (free spins feature). 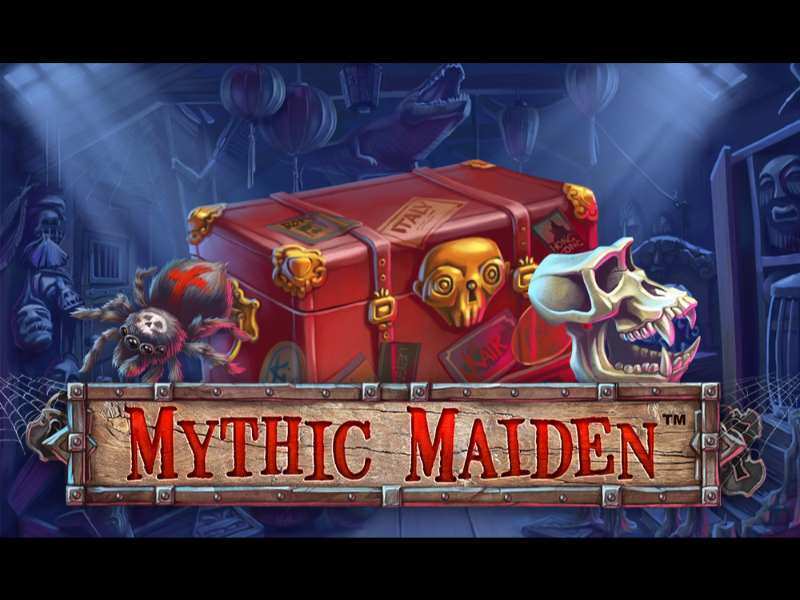 One can play free Mythic Maiden casino slot machine without having to download the game itself or to register. There is also a mobile version of this lovable game, which is supported by all devices running Android or iOS platforms. There is no need to download and install any specific app, the game can be accessed directly through device’s internet browser. And all players can enjoy Mythic Maiden even when they’re on the go! There are 12 symbols overall embedded in this amusing slot machine, 10 ordinary ones plus the wild and the scatter. Among those regular ones one can notice that there are lower paying ones (illustrated as card numbers in a form of a melting candle) and higher paying ones (a monkey skull, a magic book, a spider etc.). Among them the one that is worth the most is definitely the symbol illustrated as a creepy mask. For five of them landed on an active payline one would score a payout of an astonishing x2000 (jackpot prize)! 5 scatters – 30 free spins. Another useful thing about this feature is that it can be re-activated. That means that if one manages to land three or more scatters whilst playing this feature, he would be awarded a new amount of spins, which get added to those won during the base game! Unfortunately, scatter can’t form the paying combinations on its own. The wild is illustrated as an animation of a broken window from which one can see either the moon or the skull. It has the ability to substitute all the icons, except for the scatter. This can help the player to complete his winning combination more easily. The main Mythic Maiden slot’s additional feature considers the Iron Maiden sarcophagus which is located just to the right of the reels. During the free spins feature, this sarcophagus opens and reveals either multipliers up to x10 or one or two additional free spins after each spin. Multipliers apply to the current spin. They multiply all bet line wins, including those that involve the wild symbol. “Autoplay” and “Max Bet” are shortcuts towards the autoplay option and taking a spin with the maximum stake. “Paytable” – opens the same called option. One can find this slot, as well as slots similar to this one, such as Black Widow simply by visiting Money Online Slots. 0 responses to "Mythic Maiden Slot"